With Nokia, Nexus and Pixel devices having received their July Security Update, the Sprint variant of the Samsung Galaxy S7 and S7 Edge seem to be playing a game of catch up. 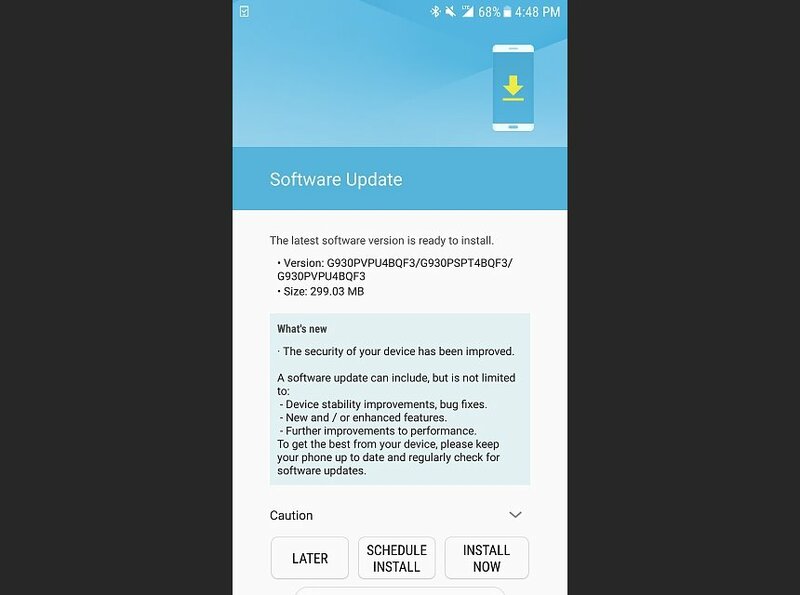 The U.S. Wireless carrier has released an update for Galaxy S7 and S7 Edge which brings them to the June Security Update. The build numbers G930PVPU4BQF3 for Galaxy S7 and G935PVPU4BQF3 for the Galaxy S7 Edge are being carried out via Over The Air (OTA) and should reach the devices in about a week. The update weighs in at 299MB and also includes miscellaneous battery and system optimizations. Since the update is being provided via OTA, a direct download link is not currently available. Users are requested to go to Settings > About device > System update and check if the update is available. Links to the update will be added when they surface online. It is a known fact that carrier locked devices get slower updates than their unlocked counterparts. Nevertheless, Sprint has a relatively faster update cycle as compared to other U.S. Wireless carriers. Who knows, maybe a July Security Update is right around the corner.